Come and read in the now famous three halves – this is the host Gary Carr’s Birthday bash so come along and celebrate with a pint and some poetry. At the Shire Hall Gallery Stafford. 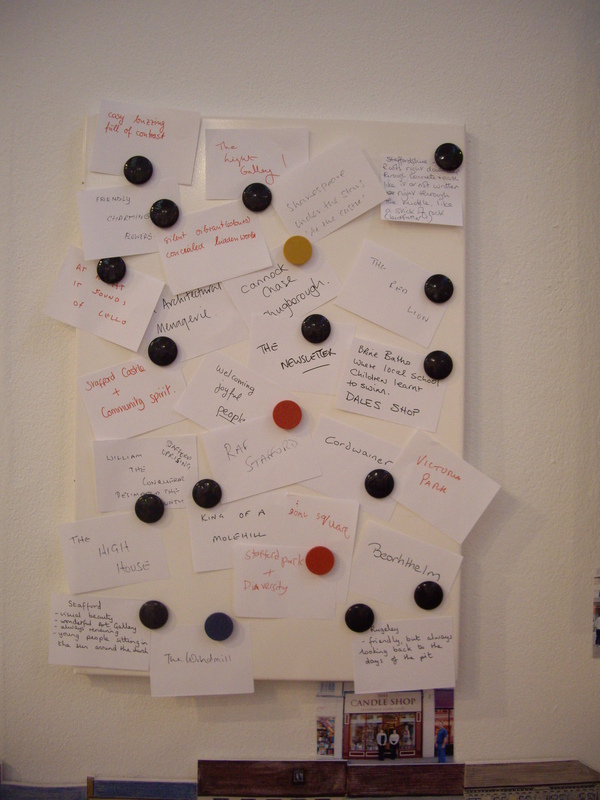 There is still a chance to add words to the Stafford Poem. 23 – Sound Sculpture of a Court Room. 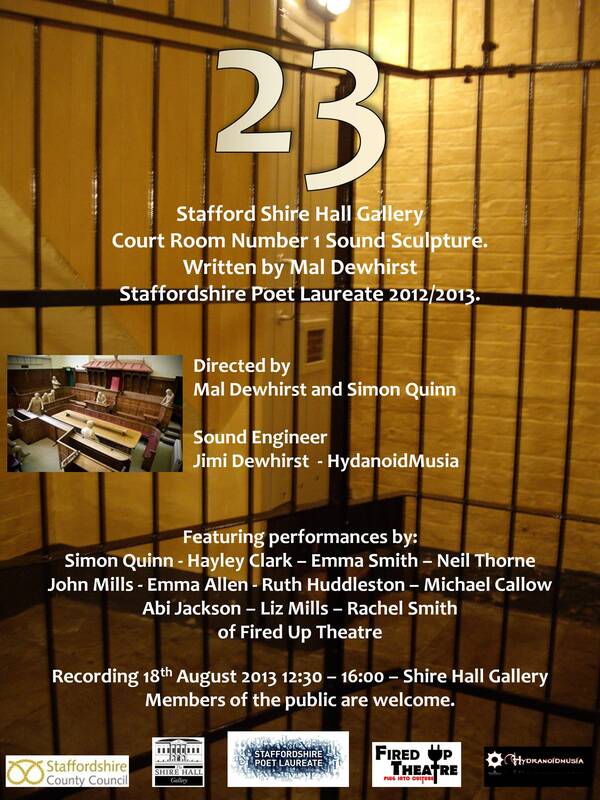 I am working with Staffordshire Arts and Archives on a poetic sound sculpture to reflect on the spirit of Court Room number 1 at the Shire Hall Gallery in Stafford. My Script is in rehearsal with Fired Up Theatre and HydanoidMusia to produce a poetic sound sculpture that will be played in the Court Room at the Shire Hall Gallery. Hear the lives of murderers, bread thieves, drunkards, coal thieves and coin clippers along with the voices of the Clerk and his wife. The recording takes place on Sunday 18th August between 12:30 and 16:00 in the court room and we are welcoming the public to come and observe and may be add their voices to some of the chants. St Dominics Literature Festival – Brewood Staffordshire. This is unique event for the writers of the future a literature festival aimed at children and young people. 31st August at St Dominic’s High School For Girls in Brewood Staffordshire. I will be sharing my Staffordshire words, hosting an Open Mic session for yound poets and introducing the British Poet Laureate Carol Ann Duffy as the guest speaker. 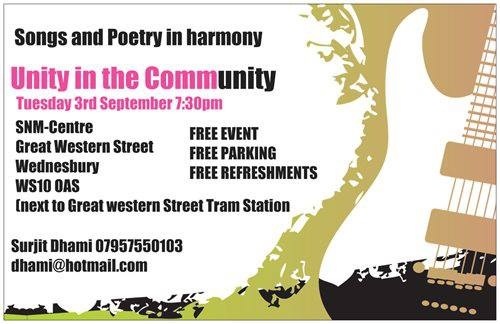 I will be reading at the Unity in the Community event in Wednesbury at 7:30 pm on Tuesday 3rd September. 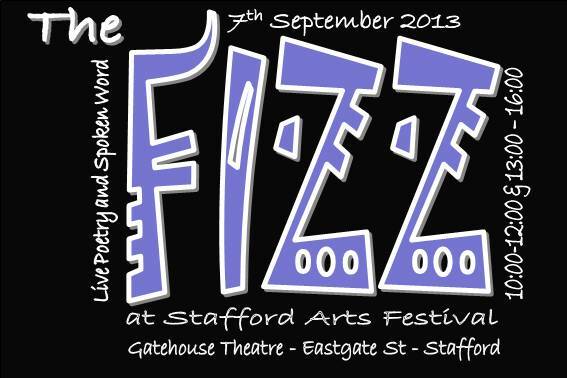 I am hosting THE FIZZ Poetry and Spoken Word event at Stafford Arts Festival on 7th September at the Gatehouse Theatre. The programme includes many local voices along with readings from the candidates for the Staffordshire and Stoke on Trent Young Poet Laureate. Readings from 10:00 to 12:00 and then 13:00 to 16:00 in the main auditorium. Other poetic events include Bert Flitcroft as Poet In Residence at the Shire Hall Library – see the timetable on the website for full details of all the arts festival events. 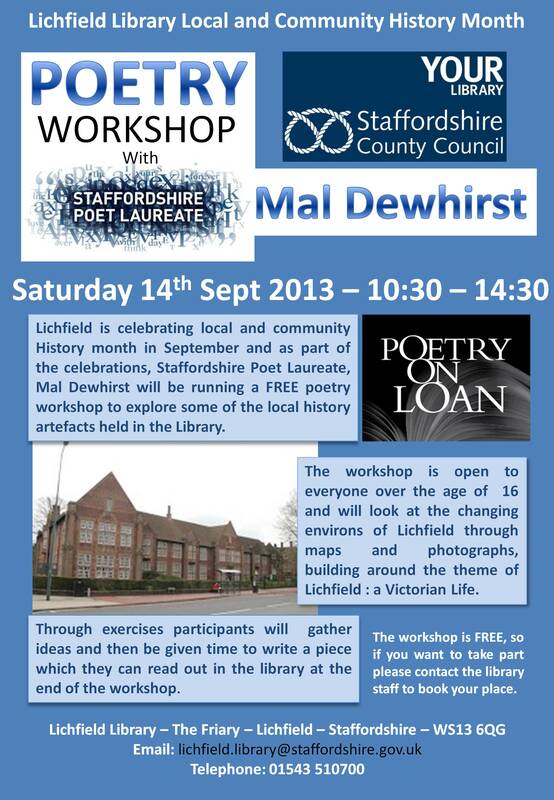 Lichfield is celebrating local and community History month in September and as part of the celebrations, Staffordshire Poet Laureate, Mal Dewhirst will be running a FREE poetry workshop to explore some of the local history artefacts held in the Library. The workshop is open to everyone over the age of 16 and will look at the changing environs of Lichfield through maps and photographs, building around the theme of Lichfield : a Victorian Life. Through exercises participants will gather ideas and then be given time to write a piece which they can read out in the library at the end of the workshop. 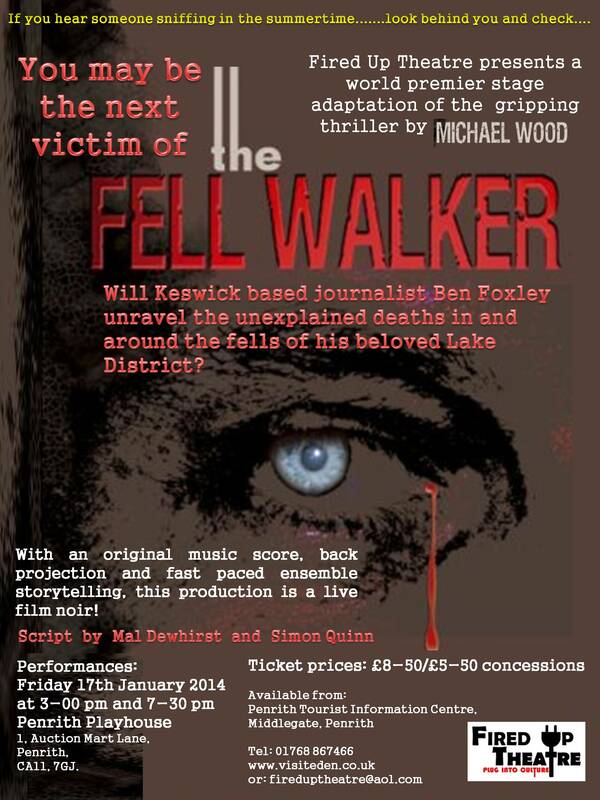 A Fired Up Theatre Production of Mal and Simon’s adaption of the novel by Michael Wood. – Script writing in August – Auditions and Rehearsals start in September – The premier is at the Penrith Playhouse in January 2014. Crossroads – Satan, The Master and The Blues. 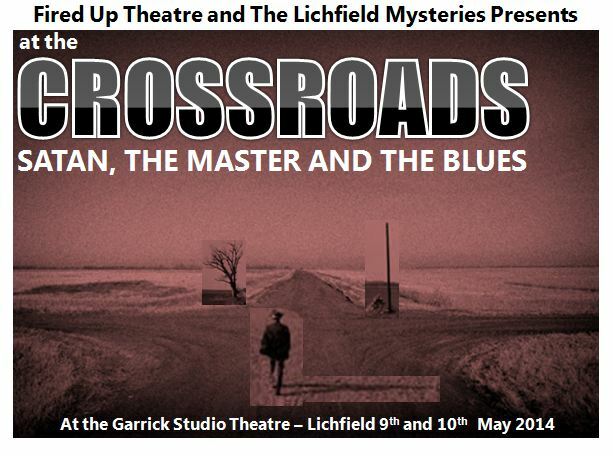 A new production by Mal Dewhirst and Simon Quinn with Fired Up Theatre for the Lichfield Mysteries to be staged at the Lichfield Garrick Studio Theatre in May 2014.